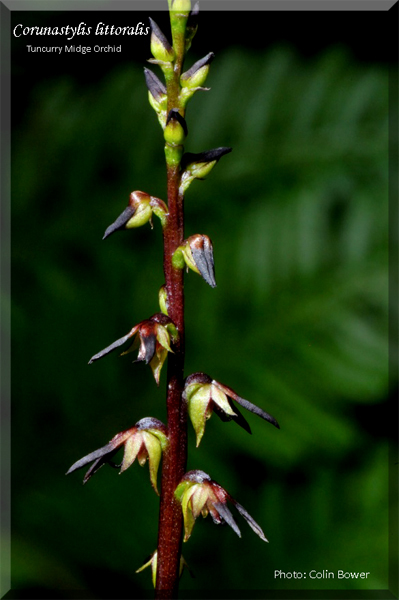 In 2015 a paper was published in the Journal of Plant Systematics Telopea (Vol 18:43-55) titled “Reproductive success and pollination of the Tuncurry MidgeOrchid (Genoplesium littorale)(Orchidaceae) by Chloropid Flies “. 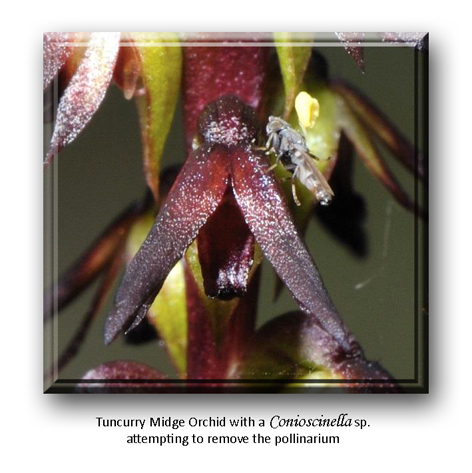 Much of the same material had been published earlier in a consultancy report for UrbanGrowth NSW, under the title “Pollination of The Tuncurry Midge Orchid (Corunastylis littoralis) Amended June 2014″ Prepared by Colin C Bower PhD. Because of their details, research papers can contain some very interesting facts of interest to a wide range of readers. This paper was no different. The aim of the paper was to identify the pollinator(s), how the attractant worked, confirm that C. littoralis was not autogamous (self-fertilizing) or apomictic (reproduction without pollination) and to assess the requirements & long-term viability of the pollinator. The following summary notes have been drawn from both the research paper and the consultancy report. Note that Corunastylis littoralis is a synonym of Genoplesium littorale. The first two are well known to many orchid lovers. The orchid promises food such as nectar but does not produce any nectar or it has the appearance and even odour of the female insect pollinator so that it fools the male. The lesser known deception is brood-site mimicry where the female insect pollinator is tricked into laying the eggs on the flower but there is no chance for survival of the off-spring. Finally the most uncommon and unusual deception of prey or carrion mimicry, known as kleptomyiophily. This method was discussed in detail in the report and made for fascinating reading although it was helpful to have a dictionary on hand. Some insects are kleptoparasitic that is they feed on the haemolymph (roughly similar to blood) but from freshly killed insects. The researchers established that the pollinator for C. littoralis was not Drosophilidae (vinegar fly) but were instead from the families Chloropidae and Milichiidae known kleptoparasitic flies. It has been observed that the pollinators swarm around the Corunastylis. This is a known behavioural pattern of kleptoparasitic flies that are attracted to the prey of other predators such as spiders, robber flies and other predatory insects. It was noted that the pollinators were dominated by females. This precludes sexual deception and suggests that the females may require the haemolymph, which is protein rich, for egg maturation. It was also noted that C littoralis is a nectar producing orchid. It was considered that the nectar contained properties that mimic haemolymph. Based upon these observations it was hypothesized that prey mimicry pollination syndrome was the best fit for the Corunastylis. 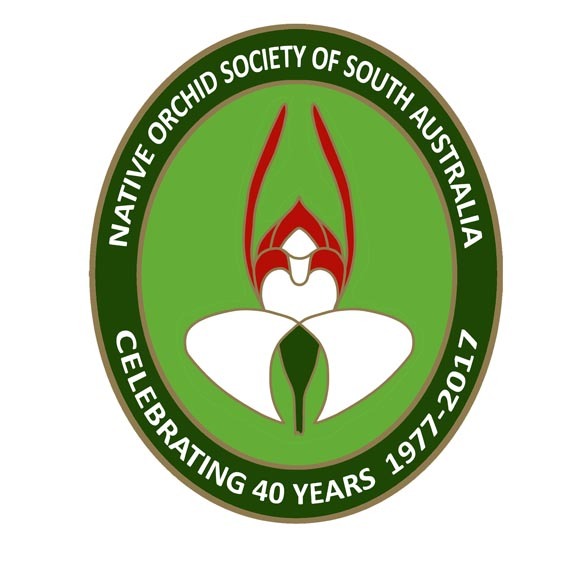 Though this syndrome has been observed in orchids in the northern hemisphere, this would be the first time that this has been demonstrated as a possibility for Australian orchids. Part two will consider the fourth aim of the paper which was to determine the method of reproduction. Thank you to Colin Bower for checking this post and for allowing the use of his photographs. 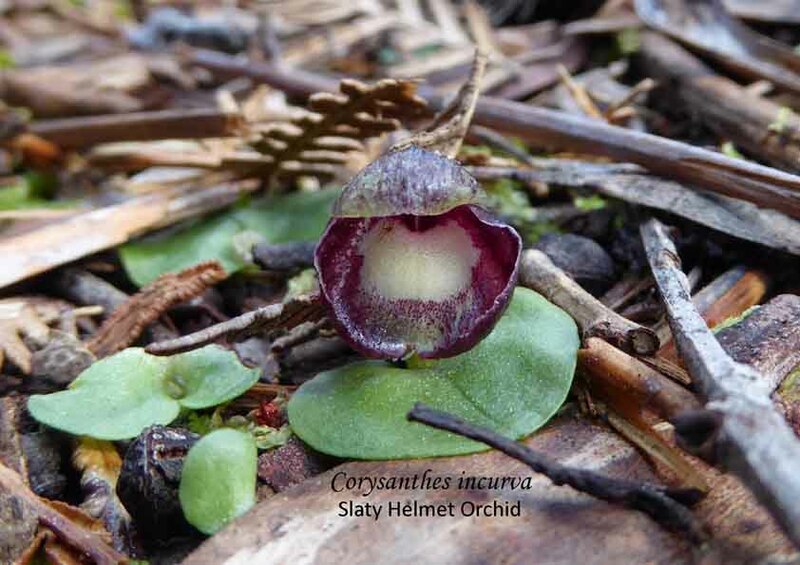 This entry was posted in Articles, Insects & Pollinators, Research and tagged Australian orchids, Carrion mimicry, Chloropid Flies, Chloropidae, Conioscinella, Corunastylis, Corunastylis littoralis, Drosophilidae, Genoplesium, Genoplesium littorale, haemolymph, kleptomyiophily, kleptoparasitic flies, midge orchids, Milichiidae, Native Orchids, Orchid Pollinators, Orchid research, Orchidology, Terrestrial orchids, Tuncurry Midge Orchid, Vinegar Fly, Wild Orchid. Bookmark the permalink.